Late last year Dodge revealed much of its future product plan to journalists in an effort to prove it had a future. Part of that plan was a revamped version of the Dodge Charger due in late 2010. Although it's not slated to be a complete redesign, the 2011 Dodge Charger will be a heavy reskin along with the introduction of Chrysler's new V6 family. This prototype was spotted recently testing in Michigan and the changes are noticeable. This car looks much closer to the Charger concept shown a decade ago at the Detroit auto show. Expect an updated interior as well as Dodge attempts to generate a little interest in the brand while the rest of Chrysler tries to hold on until the Fiat vehicles start arriving in 2012. Click on the link to see a couple more spy photos. Caught outside Chrysler's headquarters, this camo'd 2011 Dodge Charger is sporting the same canted and extended roof, along with a set of squared-off headlamps, larger grille and a more sculpted fascia. However, the extent of the exterior modifications pales in comparison to what's going on inside, with a new LCD screen dominating the dash and a smoother center stack. The new Charger won't be covered in camouflage much longer, so expect to see Dodge's refreshed sedan bow later this year with an all-new V6. I decided to do a side-by-side of the current and concept Chargers. I suppose the largest difference is going to be the grill and rearend. Nothing too drastic looking with the rest of the vehicle's silhouette. We've seen plenty of spy shots showing heavily cloaked prototypes of the 2011 Dodge Charger before, but our spy photographers just found the holy grail. Who knows how it happened, but the cover on this Charger prototype (we're guessing it's an R/T model) got flipped back to reveal the redesigned sedan's new snout for the first time and our spies snapped the hell out of it. An 8-speed automatic in the 2011 Charger? 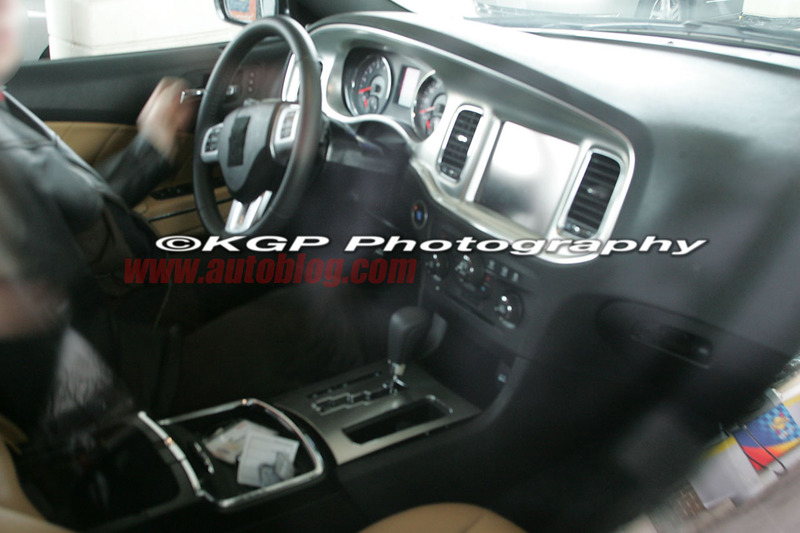 Last time we saw the interior of the upcoming 2011 Dodge Charger, we had a view of a navigation-equipped model shot from the passenger side. Today, however, we get a look at the driver's view of the 2011 Charger. Steering wheel buttons look to be fully moved from the blind back-of-wheel controls Dodge is using now to a more sensible, visible approach. The 140 mph speedometer is bring and clear, there's push-button start and remote trunk and though there's no nav, there's a large-enough screen to make iPod use tolerable. But what's that in the center console? That's not the PRND/M we're used to from Dodge. The vehicle is still an automatic, but that shifter is a gigantic step up and is awfully similar to one you'd see in an automatic-equipped BMW with a floating metal shroud a-la automatic Porsches. Eagle-eyed readers have pointed out two important facts here: 1) Chrysler will be importing the transmission before building it themselves. 2) The reader pictured top-right is a ZF unit meaning that this is a ZF built 8-speed automatic and not the five-speed auto with its gated shifter. Mea Culpa. Reader Spy: Are you the next Dodge Charger SRT8? It's no secret that Chrysler is unleashing redesigned versions of the 300 and Dodge Charger sedans this Fall and we've seen numerous images of them prowling the streets of suburban Detroit in recent months. Now another of Autoblog's eagle-eyed readers, Marty M., has dropped us a note to let us know that he had captured what appears to be the new SRT8 version of the Charger. We're assuming this is the high-output Charger based on the size of the wheels and rear deck appendage, along with the depth of the front air dam. The freshly contoured flanks are visible under the camo, but we can't quite tell if there is a new piece of glass at the trailing edge of the rear doors. The new SRT8 engine is expected to grow from the current 6.1-liters to 6.4-liters with at least 450 horsepower, and shooter Marty tells us it sounds very much how a big V8 ought to. It isn't known if the high-performance SRT version of the next Charger will debut alongside its lesser linemates for model year 2011, or if it will hang out until it can earn a 2012 designation. Either way, it's time to get excited.